Sometimes an idea takes up residence in your head and you can’t stop thinking about it until you’ve written through it. This happened to me recently during a conversation with my good friend Angela Lynn about possibilities surrounding the story of The Little Mermaid. So here is a little piece I wrote based off of that conversation. And if you’d like to read another take on The Little Mermaid (and Snow White, The Twelve Dancing Princesses, and Beauty and the Beast! 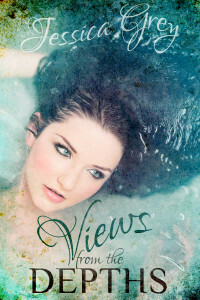 ), Views from the Depths is currently free for your Kindle. Happy Easter!! When the labor pains wracked her body and it felt like she would be torn apart by them, she ignored the horror of the midwives and climbed into a great tub of water. She let herself float–the pain seeping away. The babe had been born into the water. She had caught him with her own hands while the midwives hovered, still exclaiming at the madness of the Queen. Connal called the boy Liam. She called him Waterborn in the language of her people, but only in private where no humans could hear. It wasn’t a name that their tongues could form, or that was pleasing to their ears. From then on she only called him Waterborn in her own mind. Truly he didn’t look waterborn at all. He was a miniature copy of his father. Connal. His dark hair, his long lean legs, and broad shoulders had been objects of her fantasies for months before she’d made the reckless decision to approach the seawitch. She’d watched him and she’d loved him from afar before he even knew of her existence. Had she fallen out of love with him, or had it never even been love? How could you truly love something you didn’t understand? And no matter how long she spent with humans‒with Connal‒she could not understand them. They’d fascinated her when she had been a Mer, but fascination had turned to boredom and eventually disgust now that she lived among them…now that she was one of them. She woke in a panic; she was suffocating. Her lungs needed the sea, the sweet wash in and out of the soft, salty liquid. She couldn’t breathe without it. Something heavy was holding her down, imprisoning her. It was hot, a band of molten iron. Her hands clawed at it frantically. She turned to him, her breathing beginning to slow. Air, it was air she breathed now. The horrible, burning band was his arm. He was always too hot. Sometimes it was unbearable to be this close to him. She nodded. How could she tell him that to be here in bed with him made her feel as if she were dying? He pulled her closer and she gasped. The skin of his bare chest felt as if it were searing her. She wanted to cry out. “They’re just dreams.” She tried to dismiss them. Connal’s face relaxed. She hadn’t noticed how deeply those lines of worry had been etched into his face. She knew she’d said the right thing. “Goodnight.” She ran her hand through his hair, brushing it back from his forehead. The touch made her feel as if her hand was on fire, but she knew it would help him sleep. “I love you,” he mumbled as he drifted off. She glanced at his face. His dark eyelashes rested against his flushed cheeks. He was asleep, it wouldn’t matter that she couldn’t say it back. She could only lie so well. Kira eased back onto her pillows, wiggling out of his arms and trying to make as much space between them as possible. She felt the cool air coming in from the open window and breathed a sigh of relief. What would her life look like if she hadn’t changed? If she’d stayed with him instead of becoming obsessed with this human? Kira shook her head. She didn’t want to think of him. But nights like this when everything was quiet in the castle and she could hear the rhythm of the waves on the rocks outside, he filled her mind…his face, his smile, his laughter, his strong hands on her waist. He’d been angry, furious really, with her when she started watching the humans‒watching Connal. “Am I not enough for you?” he yelled at her. “Does this not fulfill your cravings?” He kissed her, their tongues tangling as they sank into the water and down into the sand. But even as she’d lain there, sated and sleepy with the marks of his rough kisses on her neck, she knew she would swim back to the surface. She spent hours up on the rocks, letting the sun burn her pale skin while the salt spray kept her tail damp. She hadn’t cared, she’d been…Kira rolled over with a grunt and punched her pillow. She’d been stupid. It had been ten years. Not that ten years was very long to a Mer, though it felt like a lifetime to her now. She was sure he had moved on, taken another mate, forgotten her. Kira climbed out of bed and paced over to the window. It no longer felt as if knives were stabbing her feet when she walked, but her legs never felt as if they quite belonged to the rest of her body. It was as if her joints were too loose; she was a doll that was not put together properly. Her mouth twisted into a wry smile. The seawitch was nothing if not vindictive. She stood by the open window, palms pressed into the stone. It was wet. They were close to the sea here, the castle built on a little slope of a hill that melted down into the sand dunes. That is one of the reasons it had been so easy for her to spy on Connal. Kira took a deep breath of damp air. It calmed her. She missed the sea, the ebb and pull of it. The chilly caress of the waves. The sheer energy and power. Or did she just miss him? The moon was high, a shining orb reflected in the water. She watched the spray coming up from the rocks. She felt him before she saw him. Kira froze. Her heart pounded roughly, then seemed to stop all together. His lean torso was pale against the darkness of the rocks, his tail partially submerged in the water. He was watching the castle. He looked directly at her window and Kira knew he could see her. Her white nightdress fluttered in the breeze like a flag of surrender. She turned and walked toward the door. Her feet moved of their own accord, quickly and quietly. She heard Connal’s soft breathing as she slipped through the door, but she didn’t turn back. She was down the stairs, through the kitchens, and out into the courtyard before the first doubt skittered up her spine. Why was he here? Had he been here before? What if he was still angry? The pull toward him was stronger than her fears. She felt the lap of the waves on her bare feet. She could see him more clearly now. The corded muscles in his arms bracing against the wet rocks, the heavy brows, and those same silver eyes that pierced through her skin and exposed every want and need. Those eyes watched her as she walked deeper into the water, her nightdress sticking to her trembling legs. Eventually she reached the rocks. The water was higher than her waist. It was blessedly cool and felt like heaven after the cloying warmth of Connal’s bed. “You’ve changed.” He spoke in the harshly beautiful language of the Mer. Kira blinked. It sounded just like she remembered, but somehow foreign. He nodded. She wanted to reach out and run her fingers along the column of his neck. She wanted to feel his hands and mouth against hers once more. “You want to return.” It wasn’t a question. He smiled, the quick grin she remembered so well. “Then here.” He raised his fist from the sea and opened it, palm up, toward her. A dagger lay in his hand, water running off its heavily worked gold in rivulets. The hilt gleamed dully in the moonlight and the sharp edge of the blade glistened like ice. He pushed the dagger into her hand. Her arm shook under its weight. “A bargain to free you. To free us,” he insisted. His fingers bruised into her shoulders. “What have you given her?” She finally opened her eyes. His face no longer looked the same to her. Kira gasped. Her legs could no longer hold her and she sank beneath the onslaught of the next wave. Her lungs filled with water. She sputtered, fighting frantically against the water. His hand closed around her arm and he pulled her upward. Her legs righted themselves and her feet settled against the sand so that she could stand. Kira’s fist closed over the dagger’s hilt. It bit into the flesh of her palm, marking it. She nodded. His smile was even wider. “Good. Come back to me, my love.” He captured her mouth with his. His lips were cold and punishing. They tasted of salt and freedom. Kira kissed him back with every ounce of passion she thought she had lost during the last ten years. Her free hand came up to curl into the hair at the nape of his neck. She drew in a breath as his mouth trailed across her jaw. “Forgive me,” she whispered. She brought the dagger upand plunged it into his chest. “Forgive me,” she sobbed as she cut out his heart. He didn’t resist, didn’t fight back although she knew he could. “Forgive me,” she said a third time as she looked into his wide, silver eyes. There was no sound other than the pull of the waves and a muted splash as his lifeless body slid off the rocks and into the water. Kira stared down at the heart in her hand. A half sob, half scream tore out of her throat as she dropped his heart beneath the waves. The dagger fell out of her hand and against the rocks with a clang. Kira stood in the water, waiting for something to happen. Waiting for a tail, or perhaps for death. Her whole body was numb, colder than she had ever been. After a few moments she turned toward the shore and began to walk unsteadily back toward the castle. She couldn’t stop shaking. She wrapped her arms around her waist, trying to protect herself from the bitter wind. It wasn’t until she stumbled back through the door into their bedroom that she began to feel warm. She took off her cold, wet nightdress and threw it into the corner.